Matri Mandala—TM Women Circles was inspired by women in several Transcendental Meditation® centers desiring to accelerate their spiritual development and increase their support for the Mother Divine Program℠. Matri Mandala—TM Women Circles provide an opportunity for women practicing Transcendental Meditation to inspire and support each other on their path to enlightenment, to come together to enjoy knowledge from the leaders of Mother Divine℠ and other leaders of the women’s wing of the TM organization, and to increase financial support for the Mother Divine Program. See frequently asked questions below. Within each Mandala, each Circle, women share the joy of enriching their experiences and understanding of higher states of consciousness. Leaders of the The Mother Divine Program℠ inspire the Mandalas through monthly conference calls with themes centering on Maharishi’s Vedic Science, including the knowledge of higher states of consciousness, education for enlightenment, mechanics of creation, and fulfillment of desires. Women coming together to deepen their experiences and knowledge during the Matri Mandala—TM Women Circles calls enliven within themselves the qualities of Mother Divine, such as bliss, softness, and fulfillment, which profoundly nourishes their families and environment. The Mother Divine Program also provides a retreat facility—a “sanctuary of silence”—where women can attend courses and rejuvenate, deepening their inner experiences in the nourishing, blissful atmosphere of the Mother Divine Program. To complete the circle, the Mandalas help to support, perpetuate and expand the Mother Divine Program through financial donations. All contributions are welcome and warmly appreciated. Each will add a wave of support to the Mother Divine Program. In addition, Matri Mandala members may wish to contribute in other important ways such as offering their time, skills, or expertise to help sustain and expand the Mother Divine Program. 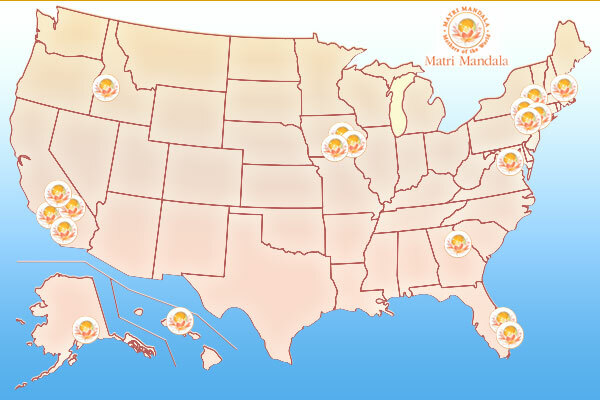 The Matri Mandala initiative began in June of 2014 and now there are many Mandalas supporting and nourishing women in TM® Centers throughout the United States. Women are coming together to enjoy profound knowledge on the Matri Mandala monthly calls, as well as to enjoy the bliss of supporting the expansion of the Mother Divine Program. Our vision is that very soon there will be hundreds of Matri Mandalas throughout the United States and around the world.
. Please let us know where you are located and we’ll connect you with an existing Mandala, if there is one in your area. If there is not yet a TM Women Circle near you, and if you are a Sidha or a Meditator, you can ask a lady certified Governor (i.e. TM teacher) in your area to create a Mandala. Or, if you are a certified Governor and would like to create a Matri Mandala, please email us at the above email address. For more information or to sign up for your local Matri Mandala group, please fill out the information below. Why would I want to join a Matri Mandala? the soft, nourishing bliss of being connected with the Mother Divine Program. monthly calls with the Mother Divine leaders for profound knowledge and inspiration. Themes of these calls will include deep principles and practicalities of Maharishi Vedic Science on topics such as enlightenment, health, abundance, education, leadership, fulfillment of desires, and fulfilling relationships. deepening the experience of pure consciousness through group meditations to accelerate the blossoming of the fullness of enlightenment and to help increase coherence in national consciousness. nourishing friendships within the Mandala and with women in other Mandalas who are growing in enlightenment and creating Heaven on Earth. helping to expand the number of participants in the Mother Divine Program to generate a greater coherent and peaceful influence in world consciousness. expanding the financial basis of the Mother Divine Program to secure this beautiful program now and for all future generations. helping to provide a permanent home for the Mother Divine Program and a beautiful retreat facility for all women to accelerate their growth of higher states of consciousness. How do I start a Matri Mandala? How many women are needed to start a Matri Mandala? An ideal number for a Matri Mandala is about 10 or more but it is fine to start with 2 or 3 women in your area and gradually build up your circle. Can I individually connect by Skype or phone to a Matri Mandala call? To ensure maximum benefit for the listeners the Matri Mandala calls are for groups of ladies. This is because one of the key purposes of the Matri Mandalas is the blissful, nourishing experience of being together in a group of women. Another is enjoying deeper experiences while practicing Transcendental Meditation in a group, which also helps to create coherence in national consciousness. Also, when women gather in a group, rather than being at home where there can be distractions, it facilitates and enhances the focus and absorption of the content of the call. Can I listen to an archive of the call? We want all those on the call to have the opportunity to ask questions live so that all may benefit. For this reason, as well as those mentioned in Question 4, individual women don’t call in and listen to the archive of the talk. If a whole Mandala has missed the call it may be possible to play a recording of the call for the whole group. Is there a minimum donation to join a Matri Mandala? A minimum of $20 per month is suggested but anyone interested in joining a Matri Mandala is invited to donate whatever amount is a joy. Every donation is appreciated. Can I join the Matri Mandala if I already support the Mother Divine Program? Yes, ladies who already offer their support to the Mother Divine Program are most welcome to be a part of a Mandala. How do I make my donation to the Mother Divine Program? DONATE HERE Online: Donations can be made online at www.motherdivine.org. Click “Donate” on the homepage and follow instructions. Checks: Please make check payable to MGANL and either give check to the Group Leader at the Matri Mandala monthly call or send it directly to: MGANL – MD Donations P.O. Box 420440 Washington, DC 20042-0440 USA It would be ideal also to fill out a donor card or donation form which can be found online at https://www.motherdivine.org/contributions/Mail-In_Donation_Form.pdf or your Matri Mandala group leader may have some. In each case, whether it’s an online donation or a check, please acknowledge how your donation was inspired – by either a particular Mother Divine Program member or by the Matri Mandala with which you are associated. Who on the Mother Divine Program benefits from Matri Mandala donations? Every Mother Divine Program participant benefits. These donations go into the Mother Divine General Fund which is used for the daily expenses, projects, and expansion of the Mother Divine Program.